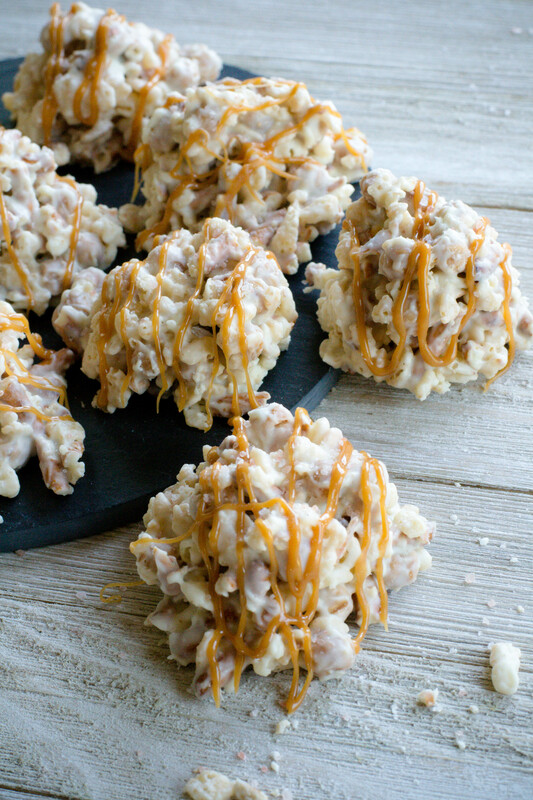 White Chocolate Salted Caramel Pretzel Crisps - What the Forks for Dinner? White Chocolate Salted Caramel Pretzel Crisps satisfied many a craving for me this past week. Chocolate….check. Pretzels…..check. Caramel……check. If I don’t quit eating, I’m going to weight a ton! One of the downsides to writing a food blog is, ya gotta eat the stuff you make!! Oh wait ….thats a perk!! Over the past few months, I have had a serious sweet tooth……I’ve had it bad! Awhile back I made Campfire Cupcakes, they were so cute. Click here for the recipe. Problem was, I only need a few pretzels for the cupcakes, so I had a whole bag of pretzels left. What to do, what to do?? I remember as a kid, cookies made from chow mien noodles. They were no bake and easy to make. Just a few ingredients……I think they were called Haystacks. Why not make something similar and use up some of those pretzels? Pretzels dipped in white bark is one of my favorite holiday treats, that salty & sweet taste gets me every time. And guess what? I just happened to have a bag of white chocolate chips just waiting to be made into something yummy. Something more than crushed pretzel or it would just be crushed pretzels with chocolate….not that there is anything wrong with that. 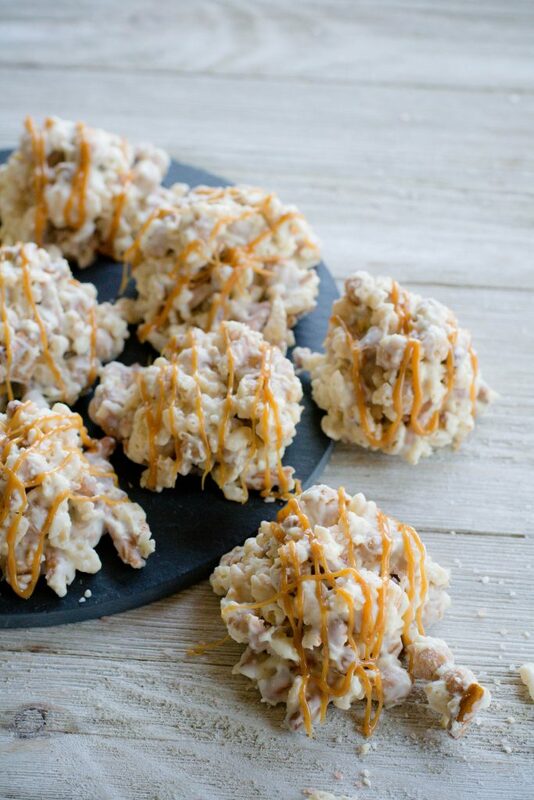 Cereal always makes a good no bake treat and rice crispy treats are always a good thing. Rice Krispies it is! Just one more thing???? Whoever thought up salted caramel is my hero. I’m sure it is passé in some circles, but I’m a fan for life! I think I have used Kraft Caramel Bits in other recipes on the site, they are the bomb! No unwrapping untold amounts of caramels, just dump what you need into the recipe. They melt with ease or just toss them into a recipe like I did here. They are soft enough to eat ….ok, right out of the bag, but also in your favorite recipe. I melted the remaining caramel bits and drizzled them over the treats and sprinkled them with a goodly amount of sea salt. Four ingredients, no baking, just a few minutes of melting and mixing and ta da!! 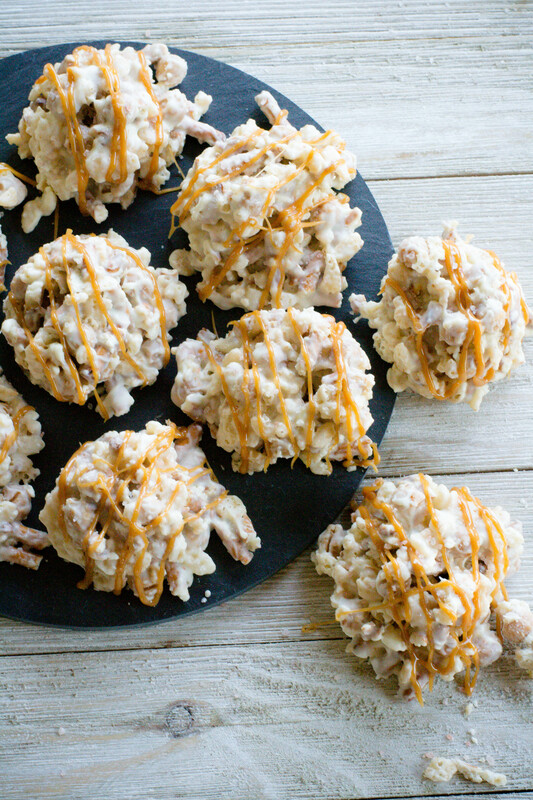 A cookie, candy, sweet & salty treat! Melt the white chocolate in the microwave according to package directions. 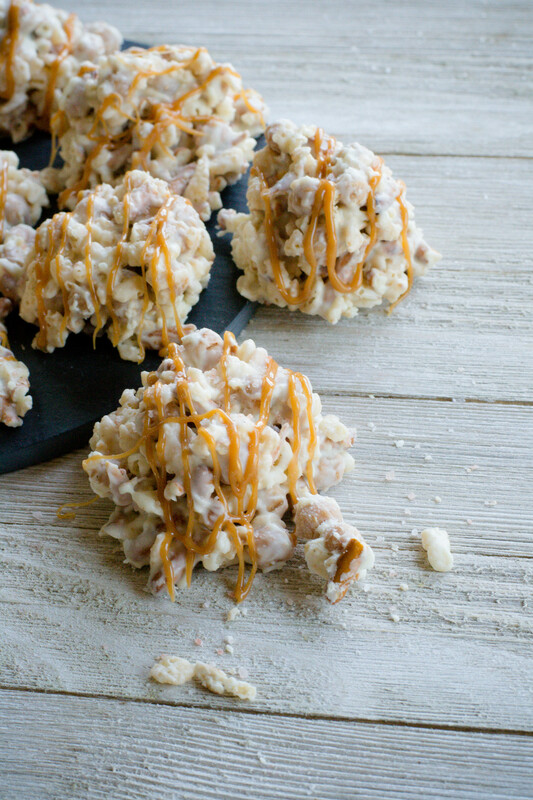 Add the Rice Krispies cereal, caramel bits, and crushed pretzels. Using a small ice cream scoop. Drop by scoopful onto parchment paper lined baking sheet. Allow to dry at room temperature until hardened. Melt the remaining caramel bits according to package directions. Place melted caramel in a ziplock bag being careful as it is very hot. Snip one corner off of the bag and drizzle over hardened crisps. Sprinkle with coarse ground sea salt (I like Pink Himalayan) Allow the caramel to dry and enjoy! Store leftovers in an air-tight container.